Anxiety disorders are among the earliest emerging disorders and most common mental health problem across the lifespan. A common characteristic of individuals with anxiety is poor attentional and cognitive control. Therefore, researchers are interested in how cognitive functioning relates to anxiety in young children. In particular, research has demonstrated associations between anxiety and electrophysiological markers of cognitive control skills such as the error-related negativity (ERN). The nature of the anxiety-ERN relationship is not well understood, however. 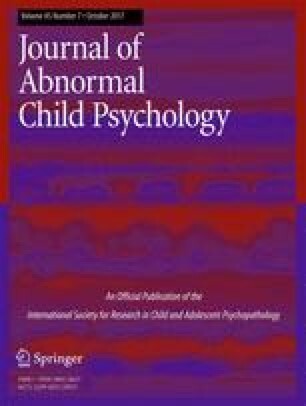 The purpose of the present study was to examine: 1) the association between the ERN and diagnostically-defined symptoms of different anxiety disorders; and 2) the extent to which disorder-specific symptoms of anxiety moderated the association between ERN and behavioral performance on a Go/No-Go task in a sample of 139 children 5–8 years of age (70 females and 69 males). Results suggest that more separation anxiety disorder (SAD) symptoms are associated with a smaller ΔERN, even after controlling for other anxiety disorder symptoms. Children with more SAD symptoms showed higher error rates and failed to exhibit the expected association between ΔERN and behavioral performance, suggesting ineffective error-monitoring in young children with SAD problems. The online version of this article (doi: 10.1007/s10802-016-0247-4) contains supplementary material, which is available to authorized users. This study was funded by the Fuller Theological Seminary/Thrive Center in concert with the John Templeton Foundation (IH116).